Bacon adds wonderful flavor to the soup, but it’s equally delicious without it; if you omit the bacon, sauté the vegetables in 2 tablespoons olive oil. If you don’t want to bother with dicing the beets, parsnips, and carrots, grating them by hand or in a food processor works just fine. Ketchup is an unusual addition, but it boosts the umami, thus enhancing the soup’s lusciousness. I prefer roasting beets to concentrate their flavor; however, the soup may also be made with boiled, steamed, or microwaved beets. 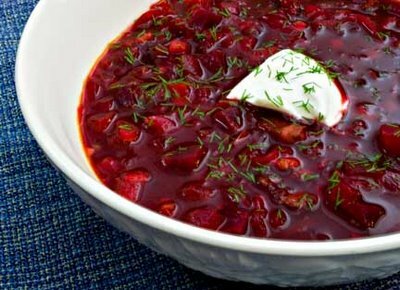 If the beets are cooked ahead of time, Beet Soup makes a quick and tasty meal. Sauté the bacon in a Dutch oven until the fat has rendered and the bacon begins to brown. Add the parsnips, carrots, celery, and onions, and sauté until the onion softens. Add the garlic and cook for one minute. Stir in the stock, tomatoes, ketchup, beets, and cabbage. Bring to a boil, cover, turn down the heat to low, and simmer for 30 minutes. Uncover and cook for 10 minutes, or until the vegetables are cooked through and the broth is flavorful.